Though most bicycle tires are measured and labeled in inches, road tires like the 700c and 650c are measured and labeled in mm. You can convert inch-based and metric tire designations to a metric format developed by the standardization groups ISO and ETRTO. This standard simplifies the search for matching tire and wheel sizes, since a tire's actual measurements often do not match the size by which it is named. The ISO/ETRTO number appears as two digits separated with a hyphen from a set of three digits. For example, a tire that measures 26 x 1.75 inches has an ISO/ETRTO number of 47-559, while a tire measuring 700 x 23 mm is equal to 23-622. The first number gives the inside width of the tire, which can be compressed or expanded somewhat to fit a range of wheel widths. The second number gives the diameter from bead seat to bead seat on the wheel on which the tire fits. The bead is the stiff part of the inner circumference of the tire, which sits on the little ledge, called a bead seat, on the inside of the rim when properly installed. 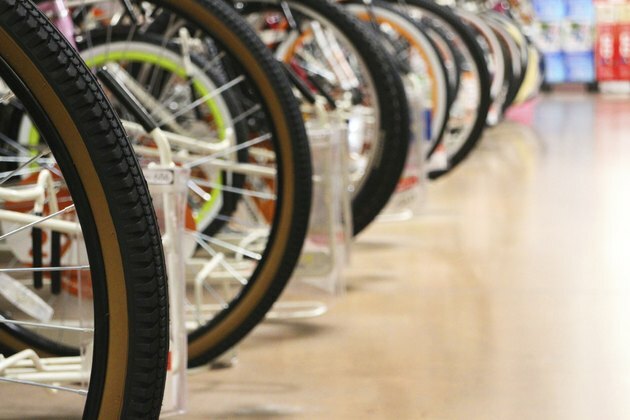 Competing tire and wheel measurement systems can make finding the right tire for vintage bikes extremely challenging. The late bicycle mechanic Sheldon Brown noted that there were four different types of 26-inch wheels, developed in different countries and by different manufacturers, that used fractional measurements for width, such as 1 1/4. Only one decimal, such as 1.25, measurement system is commonly used, but pre-1940s U.S. lightweight bikes are the exception. However, with ISO/ETRTO numbers, you can distinguish all types of 26-inch wheels. Other wheel sizes, including 20-inch and 24-inch, have similar inconsistencies. Though many tires and wheels are printed with the metric ISO/ETRTO number, you may need to measure this yourself. The easiest way to determine the ISO/ETRTO number is to measure the circumference of the wheel in mm along the bead seat. Then, divide this circumference by 3.14 and round to the nearest mm. If you have a rim without spokes or hub installed, you can measure straight across the rim to get the bead seat diameter directly. A wheel labeled as 700 x 25 mm isn't 25 mm wide; rather, it's the ideal size to accept a tire measuring 700 x 25 mm, which means it's narrower. However, you do have some room for variation in tire and rim width, though they must always have the same bead seat diameter. The tire must always be wider than the rim when installed on the rim, even if the ISO/ETRTO width is smaller on the tire. Most rims can take a range of tire widths; for example, Sheldon Brown notes that a rim with an inside width of 17 mm can accept tires 25 to 37 mm wide. Using mismatched tires and rims can damage your rims or cause frequent pinch flat tires.